Greek Jewelry :: Silver Bracelets :: Symbols of Greece Bracelet - 6.4 in. Home/Greek Jewelry/Silver Bracelets/Symbols of Greece Bracelet - 6.4 in. 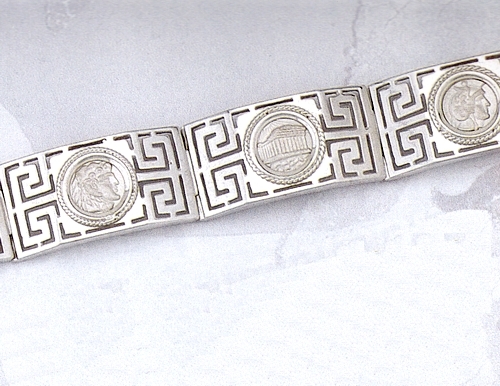 Symbols of Greece Bracelet - 6.4 in. A beautiful silver bracelet depicting symbols of ancient Greece, like the Parthenon, the Minotaur, Alexander the Great, etc. You can even select your own symbols if you wish!